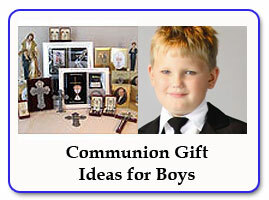 First Communion is one of the most significant events in the life of a Catholic Child. For that occasion, you often find little girls wearing veils and gloves. And young boys wearing ties and in some cases, even a sport coat. 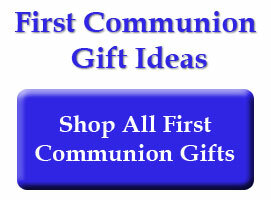 To help families prepare for the day, we offer a nice selection of Communion Veils, ties and other accessories. 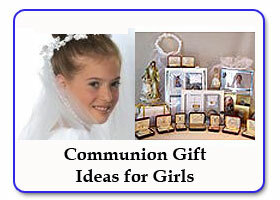 For girls especially, it is quite common for them to receive First Communion jewelry which includes items such as a cross or crucifix. A delightful new variation on the theme of religious jewelry is the sacramental charm bracelet. For boys who typically do not get jewelry as a gift, this day is a significant exception. It is very common for young boys to receive a necklace with a cross, crucifix or other religious medal such as a four way medal. For both boys and girls, First Communion is often the time when they are give their first scapular. The traditional cloth scapular or the scapular medal, each will have the Sacred Heart on the front and Our Lady of Mt. Carmel on the back. A gift book or First Communion Bible is a wonderful way to encourage the growth in understanding of a First Communicant. We are so glad to be able to offer some wonderful children's books, including the Book of Heroes, the Treasury of Saints and the timeless classic stories of the Lives of the Saints. First Communion (First reception of the Eucharist) is one of the three Catholic Sacraments of Initiation. The Catechism of the Catholic Church calls Eucharist "The source and summit of the Christian life." Such a powerful statement underscores the significance of a child's first participation in this Sacrament and helps us understand the importance of this celebration in the life of a child and his or her family. In the Eucharist a Catholic receives the real presence of Jesus under the appearance of bread and wine. It is the "bread of life" and the "cup of eternal salvation." Typically a Catholic child will receive First Communion after he or she has reached the "age of reason", generally in second grade. Reception of the Eucharist follows a time of preparation and the reception of the Sacrament of Reconciliation. The symbols most closely associated to this sacrament are bread and wine, represented in the circular host and the chalice. Also important is the crucifix which represents the sacrifice of Christ. The Rosary has a traditional connection to First Communion in that it is the most well known and used form of devotional prayer in the Church. Participation in Holy Communion marks an growth in spiritual life, which is nurtured by prayer.